If you love unique jewelry an inside out coin ring may be a piece that interests you. These rings are inexpensive to make. The cost is only a fraction of the price of what a similar ring can be purchased for from a jeweler. You can make your own version my removing the middle of any coin, reversing the coin inside out. You can even make a men’s verison with a half dollar, and a women’s version with a Quarter. 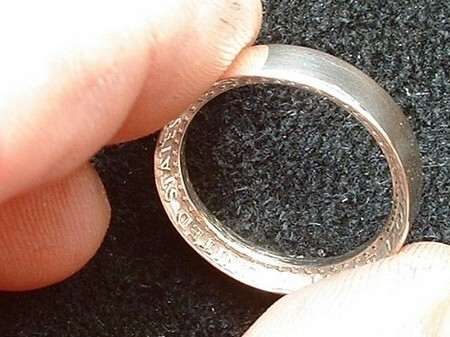 Pennies and dimes can be used for young children rings. If you want a ring that is real sterling silver you should find a quarter or silver dollar minted before 1964. Find a surface to work on. Hold the coin of your choice on its edge between your thumb and forefinger. You want to hammer the edges of your coin. Turn the coin and make sure the edges are being widened and the diameter of the coin is reducing in size. Be careful not to hit your fingers with the hammer. This process should take about 10-15 minutes to complete. You’ll need to use a drill for this next step. Drill a hole in the middle of the coin. When you are drilling the hole, the coin will get stuck on the tip of the drill bit. Do not remove the coin from the drill bit. Take some sandpaper and smooth out the edges of the coin. Place the sandpaper against the coin. Power the drill to the ‘on’ position. As the coin spins on the end of the drill bit it will be polished against the sandpaper. Use a pair of rubber tiped vice grips to clamp the coin. If your vice grips does not have rubber tips, you can wrap a cloth around the metal grips so that the coin doesn’t slip. Use a dremel with a cutting bit to cut out the middle of your coin. Make sure your coin is secured by the vice grips. Switch the dremel to ‘off’. Exchange the head of the dremel with a sandpaper disk. Sand the inside of the coin. Make all surfaces smooth. You want to take you rtime and make sure the surfaces are completely smooth. Now, you need to exchange the sandpaper disk to the buffing wheel. Buff all the surfaces of the ring. Make sure you buff inside and outside creating a shine.